More than 4,000 business cards flooded Rutgers University’s 5 campuses in New Brunswick and Piscataway this year in a move by Chabad House Jewish Student Center to draw attention to its upcoming Simchat Torah Festival held this past Monday night. Approximately 30 student volunteers gave out business cards which read “Simcha – It’s Your Business for the New Year 5773: Come Celebrate Your Jewish Identity!” to fellow students in front of Brower Commons, Livingston Student Center, Rutgers Student Center, and in classes, gym and dining halls. Directed by Rabbi Yosef Carlebach, who arrived at Rutgers back in 1978, the Simchat Torah Festival first came to Rutgers when the Chabad House was in a small, transformed firehouse on Sicard Street, one block from College Avenue, and featured humble, but lively dancing on the streets with the one Sefer Torah they owned back then. Today, housed in the new, expanded 95,000 sq. ft. Chabad House Complex on College Ave., Simchat Torah Live at Rutgers brought together and fed well over 800 students, and included a dance-march down College Avenue climaxing in a huge dance celebration in front of the Rutgers Student Center. This event was the closing, grand finale event of a highly-successful month of High Holiday observances, services, meals and celebrations planned and organized by Chabad’s campus Shluchim, Rabbis Baruch Goodman, Shaya Shagalow, and Shraga Crombie. The massive effort attracted over 2,000 students and their guests, including many for whom it was the very first time celebrating their Jewish heritage, during Rosh Hashanah, Yom Kippur, Sukkot, Shemini Atzeret and Simchat Torah. Rosh Hashana, the Jewish New Year, was the beginning of the Chabad activities for the upcoming year, with a large group of students participating in the free holiday services in the Chabad House, open to all students without a need for registration and without any payment. The students were welcomed by the campus rabbi Baruch Goodman, who led the inspirational services with singing and short stories, and the free, gourmet, High Holiday meals were sweetly prepared by Head Chef Chezky Adler. The days between Rosh Hashana and Yom Kipur were spent preparing for Yom Kipur, with scores of students participating in the classes given by Rabbi Shagalow, discovering the inner depth and meaning of Yom Kippur, the holiest day of the year. On the night before Yom Kipur, 50 students came to the Chabad House to perform the Kapparot ritual with live chickens. On Sukkot, the campus Shluchim covered the various Rutgers campuses, with Rabbi Goodman in the Chabad House welcoming the students, Rabbi Shagalow travelling on College Avenue with a Sukkah Mobile, and Rabbi Crombie visiting the nearby Livingston Campus. A group of Bochurim from Crown Heights was also organized to drive around with a Sukkah Mobile and helped the Shluchim offer students on the streets the opportunity to enter the Sukkah, shake the Lulav and Etrog, and make a blessing on some refreshments while in the Sukkah. A festive Dinner Under the Stars took place on the first and second nights of Sukkot, with 300 students filling the large Chabad Sukkah, participating in the holiday program led by Rabbi Goodman and enjoying delicious foods and desserts. On Thursday night of the Intermediate Chol HaMoed week of Sukkot, Chabad sponsored its annual Sukkafest, with a live band, game tables, and a Pizza-in-the-Hut Outdoor Buffet in the Sukkah, with over 400 students participating. 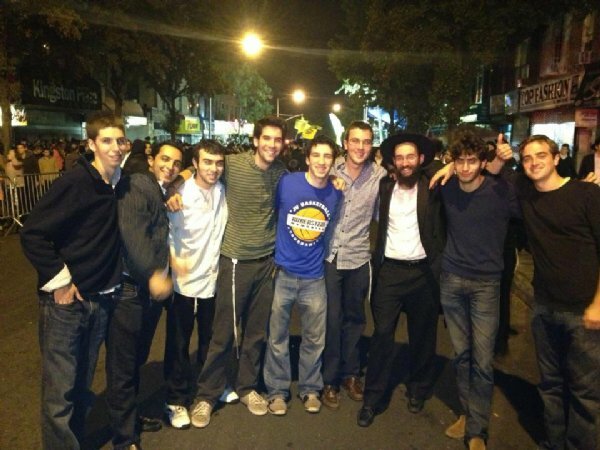 On the night of Hoshaana Rabba a group of students travelled to Crown Heights to participate in the Simchas Beis Hashoeva, dancing and singing with Rabbi Shagalow, getting the feeling of real joy. The highlight of the month was undoubtedly Simchas Torah, with 800 students dancing for hours with the Torahs, dancing in and outside the Chabad House, showing true Jewish pride. The Shluchim are already busy planning the myriad of activities for the upcoming months in keeping with the theme of the business cards: Simcha – True Jewish Joy: It’s Your Business.